Karate and martial arts offer something no other sport offers. It encompasses aspects of life that would never get addressed in a routine sport. Sport is an absolute necessity in a child’s life but what if you could get more out of a sport than just incredible fitness. What about reaching optimum fitness goals, a heightened sense of community, a new level of focus and self-awareness, a tangible goal based incentive to keep training. In brief increase fitness, flexibility, strength, balance, stillness, self-control, confidence, co-ordination, posture, concentration and true spirit. Some parents may think they also promote violence, but that’s a myth, according to experts. The martial arts actually help teach self-discipline and socialization skills. In fact, many parents whose children have attention-deficit/hyperactivity disorder (ADHD) report great success with these programs because self-control and concentration are exactly the skills underdeveloped in ADHD kids. Why do they say that karate helps sharpen the mind? 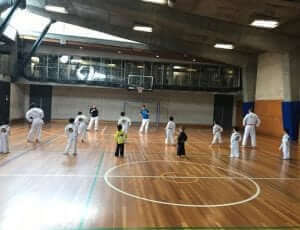 In a world filled with mind numbing video games where the child is fed instant images, Karate brings back the basics of having to complete varying levels of complicated movements in succession to unlock the visual memory meaning they are creating a picture in their minds required for academic excellence necessary for maths reasoning and basic reading skills. As their visual memory increase so does their academia. 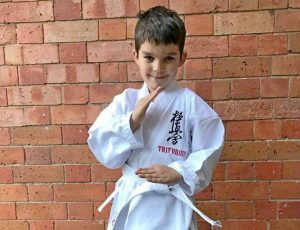 Trifu Dojo Martial Arts unlocks the child’s potential for increased learning. Far fetched? No! Martial arts use techniques that create neural pathways between the left and right sides, or hemispheres of the brain. The left-brain focuses on reasoning, maths, speech, control, analytical thought, phonics, and linear thought (following instruction or individually initiated step by step processing). Right brain dominant are more, what are generalized as artistic, such as strengths in musical ability, problem solving, discerning shapes and colours, emotional responses, daydreaming, creativity, expression and tone. The right brain dominant child can be a daydreamer and has difficulty with focusing and conscious control often acting out without thinking. By exercising across the vertical midline of the body and using the physical left hand and right hand sides of the body in a co-ordinated movement. Quite often the left and right hemispheres do not communicate properly creating learning disabilities, but even the most gifted student can benefit from this form of adaptation. It is scientifically proven people who train for extended periods have the benefit of left and right brain hemisphere balancing activities. Can’t children gain fitness from most activities? In a world filled with excuses and leniency it is commonplace to find us being prey to giving in and not pushing ourselves due to a misguided fear of either the unknown or failure. Failure is the predecessor for success …… If you never try you can’t fail. Sound familiar? As a community we have stopped expressing that we must face fear of loss and failure in order to strive for better. Little Jimmy tears up or has a full blown tantrum due to being frustrated that he has been beaten yet again at a sport or has difficulty completing a task (a normal and expected part of development), do we take him away from the situation for fear that he will “fall apart” again if he doesn’t succeed or teach him that as long as he knows he has tried his best he will always improve. Trifu Dojo gives him the confidence to keep trying. We treat each child as an individual. We believe in all our students. Yes some are better than others but it is the way they are handled that can bring out the best in them and their training. Martial arts has its origins in an extreme form of this philosophy. If you weren’t strong and didn’t persevere you could potentially die in battle. Fortunately the stakes aren’t quite so high these days but a strong positive attitude to fitness and awareness of our bodies is the by-product that has remained and is what Trifu Dojo stands for. We train toward stronger body utilising core strength, fitness hand in hand with flexibility. These factors once set in place in childhood create the correct pathways for a lifetime. Other sports can cause damage that can reveal itself later in life, martial arts by its very design incorporates the whole body using its own weight for resistance and utilising a wide range of movements to prevent injuries from overly repetitious or dangerous movements. I want my child to be a part of a group that challenges them but to have a personal achievement not based on how the team performs. Karate and the martial arts are not a sport per say, yes it has fitness as a component and a competitive component, but it is most importantly a personal development tool. It creates a self awareness, a self discipline in its teaching and as a functional part of the day to day class. These skills aren’t evident to the child that happily comes along to just enjoy the class. Through the evolution of the training dynamics in the classes the student is exposed to having to hone these skills in order to further him or herself. Once you commence the journey into Martial Arts you can take personal pride of your achievements, your battle is with yourself! You are challenged constantly to do your personal best but in a group environment where you are propelled to succeed by the involvement of others. Children who get involved in martial arts reap numerous benefits. One of which is the physical benefits where they practice punching, kicking, blocking, jumping and running during class. They will also grow emotionally and learn about having respect, discipline, self-control and many others. As they get older, the training becomes intense, but it’s always fun.